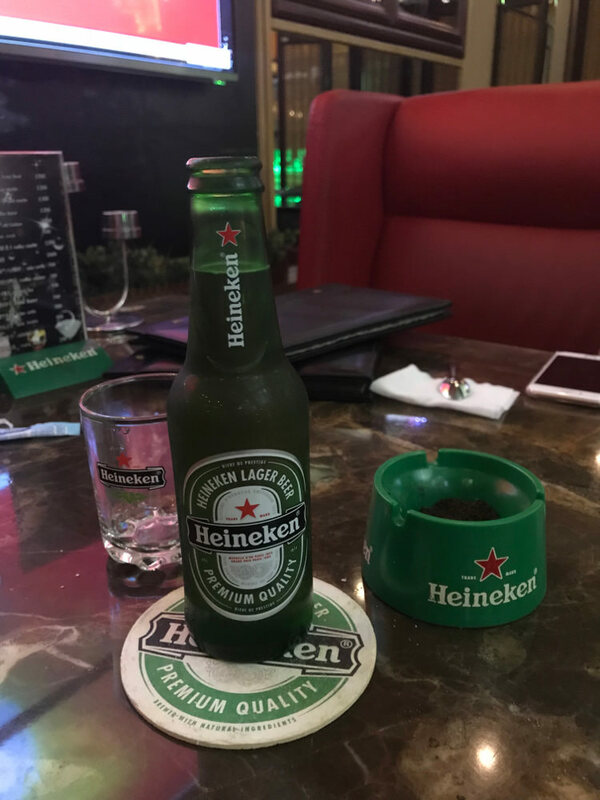 Readers may be surprised to learn that Pyongyang has its own (unofficial) Heineken bar. I was most surprised too, especially given that I discovered it purely by chance. The story goes back to late April. It was the weekend and the weather was beginning to warm and myself and some of the other Kim Il Sung University foreign students wanted to take this opportunity to explore more of downtown Pyongyang. 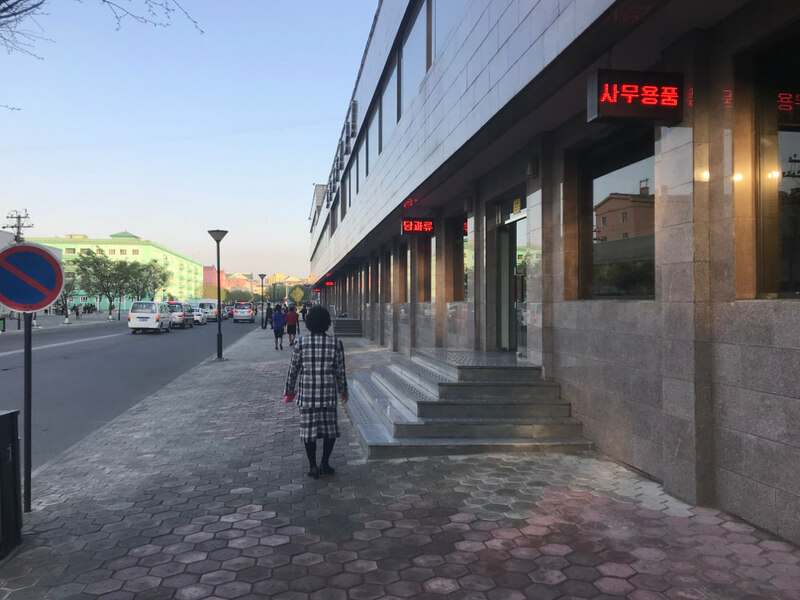 I had asked one of the veteran Chinese students (who had completed her undergraduate and was half way through her master’s– spending over six years in Pyongyang in total) for some restaurant recommendations. I jotted down her list, and on this particular weekend we voted to try out a Chinese-style hotpot restaurant near the Potonggang Ryugyong Shop (which sells a lot of high end imported goods). That way we could take a peek at the shop too. The outside of part of the Potonggang Ryugyong Store. After having a quick look at the store, we began to feel peckish, so we began looking for the restaurant. During our search we entered an establishment that looked like a Chinese nouveau riche bar, “this can’t be it”. After this we discovered a restaurant inside a small door just inside a nearby alleyway. The name didn’t match the one that the Chinese student gave us but we thought it would be worth a try. The staff ushered us in and we sat down and browsed the menu. And lo and behold we did see hotpot on the menu, and for only 15,000 won (just under $2 USD) a serving. There were some other interesting sounding dishes on the menu too such as pork and peanut stir fry. As we had just about decided what to order the restaurant worker who brought us in approached us with an apologetic look on her face. “I’m sorry but we’re unable to serve foreigners in this restaurant”. The colour drained from our faces. Then this isn’t the restaurant the Chinese student had recommended to us. If only we had Google Maps, none of this would have happened– I thought. “I can show you to a restaurant nearby that does serve foreigners though”, she added. Why not, we thought. She took us outside and slightly further down the alleyway to a vacant concrete lot, and then around the corner. There we saw a nondescript “refreshing drinks” (청량음료) sign. The only indication of what might be inside was that the door was a little nicer than usual, with brass handles and decorative padding. “In there, goodbye then”, she returned to her restaurant. 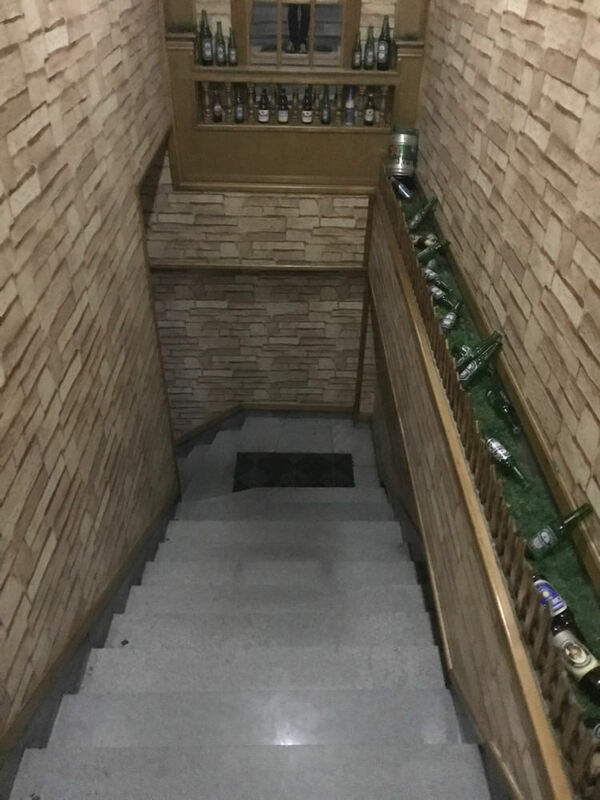 We opened the door and went up a staircase lined with Heineken bottles and a mini Heineken keg. 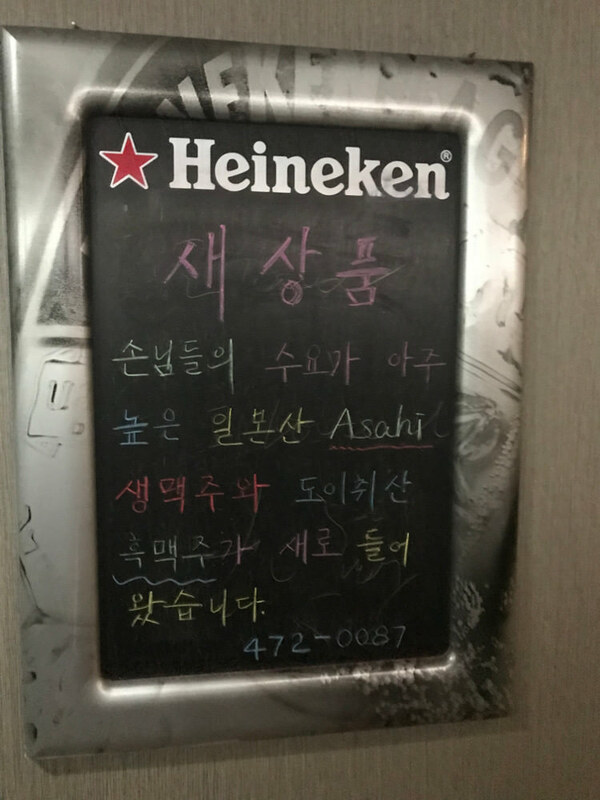 There was another door, and outside of which was a Heineken blackboard, with a handwritten notice announcing that they had Asahi beer in stock. Perplexed but intrigued, we opened the door and went inside. The staff greeted us and guided us to our seats. It was a nice little bar with an interesting design ethos. Pictures of palm trees on the wall and a Christmas tree (these are commonly used as mere decoration in North Korea, even in the middle of the summer). But what struck one the most was the Heineken memorabilia as far as the eye could see. 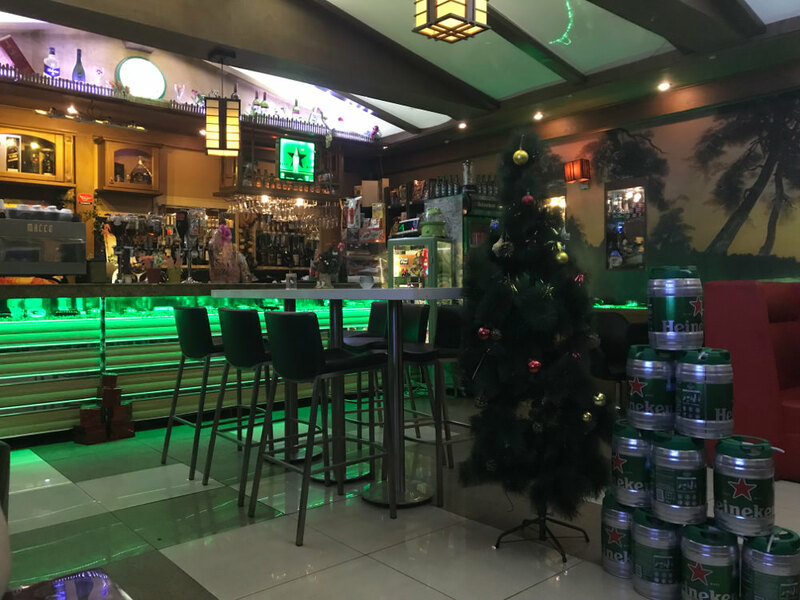 A Heineken clock, a stack of Heineken kegs, two Heineken neon signs, Heineken coasters, Heineken ash trays, Heineken water glasses, and a Heineken fridge. And Heineken beer of course too. We got some coffee and then some beer. 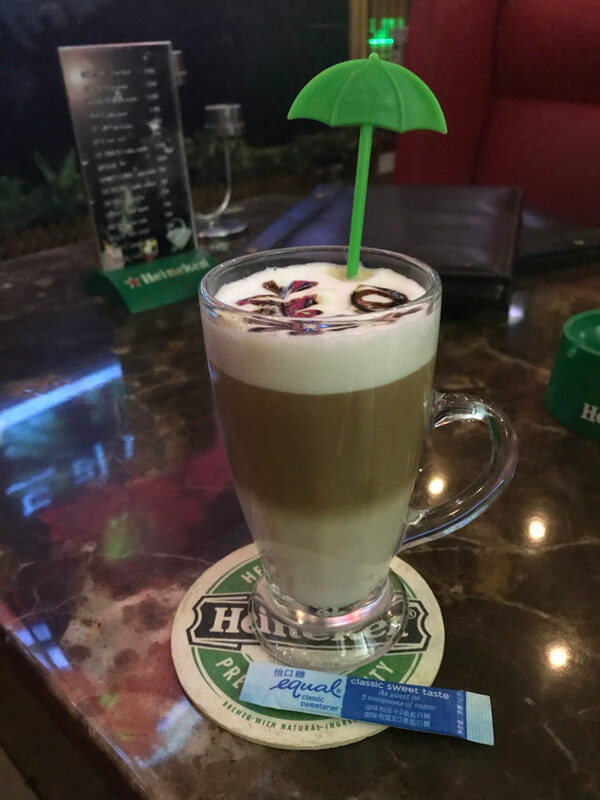 The beer was relatively cheap, but the coffee was $6 USD for a latte. Browsing the menu we saw that it was $4.5 for chips, $3 for a bibimbap and $15 for a long island ice tea. There were a few other people there. 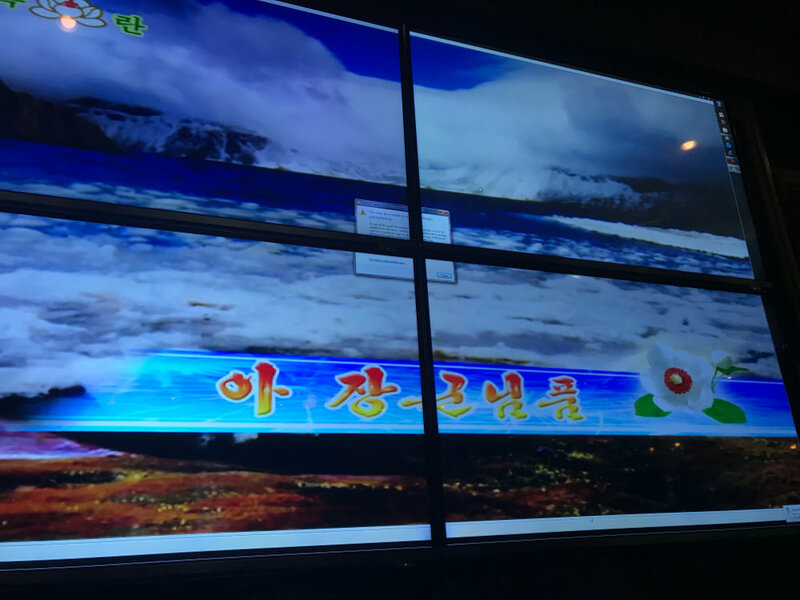 North Korean music videos were playing on a composite screen consisting of four screens put together. It was through a Windows computer, and there was a “you may be a victim of software piracy” popup window in the middle with a button urging the user to “get online to resolve the problem”. Good luck! We left. Afterwards, I was actually glad that we didn’t have Google Maps. If we’d found our original destination we never would have discovered this little gem.